I've already shared a few of my post-Christmas, Thank You, cards this month and today I have two more. This first one will most likely get used this spring or summer. The image is a stamp from House Mouse and I think it's one of the sweetest and most versatile of all the HM stamps I own. I used colors from the inspiration photo at Ellen Hutson. I colored the image with polychromos pencils and blended them with the blender included in the pencil set. 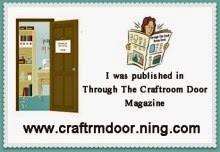 I cut the image and the frame with stitched dies from Cottage Cutz. 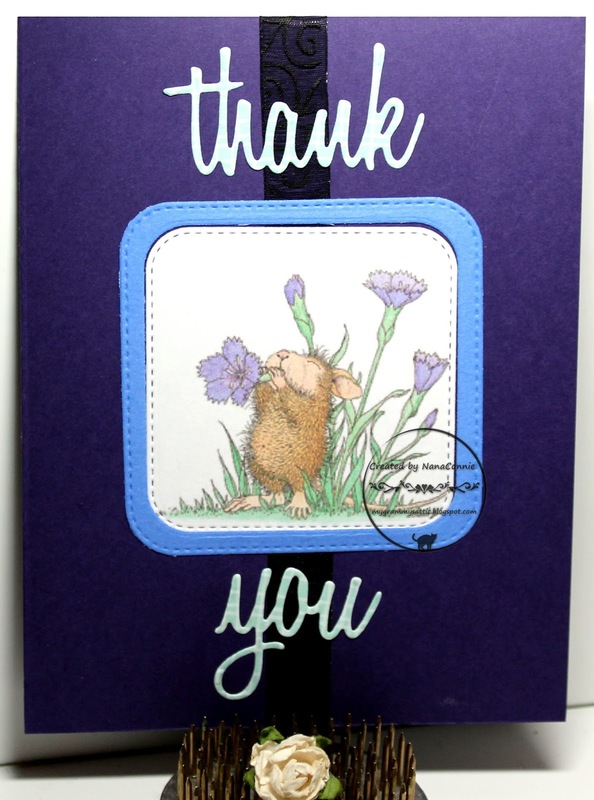 I dug out some royal purple CS and used that on the front of the card base. 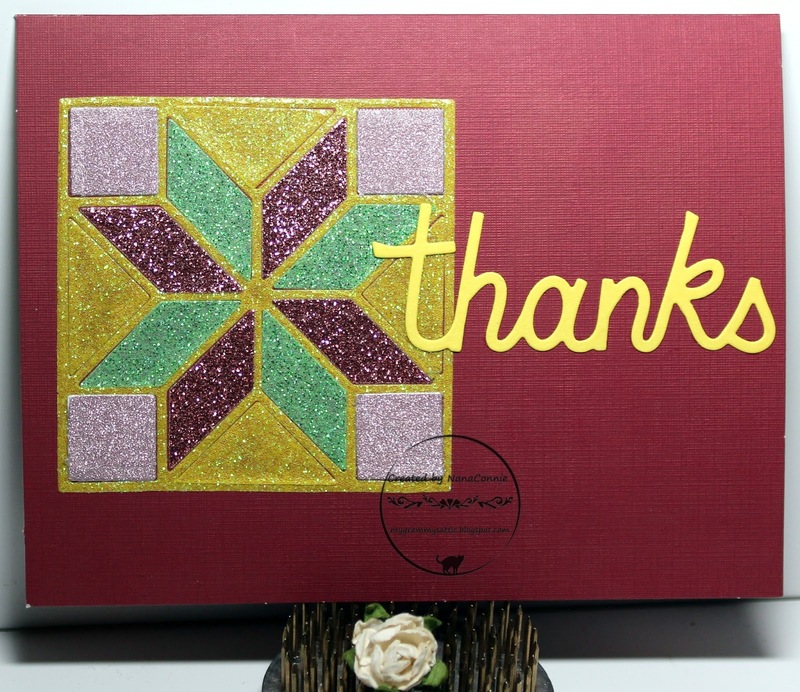 I cut the Thank You with a die set from Memory Box. Memory Box has some really fantastic "Thank You" dies and this one is probably my favorite of all of them. I like that it's not capitalized and therefore looks more casual and less formal so it works with almost any card design. 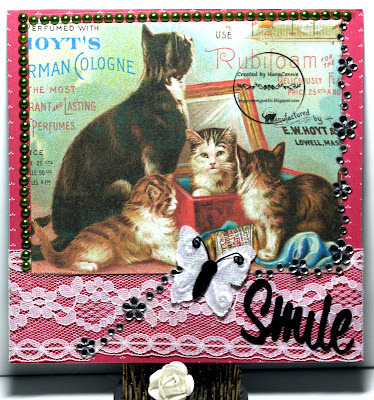 I wrapped the card front with black, satin ribbon, then began layering on the sentiment and image pieces. I left the card very CAS because it will probably have to be mailed. 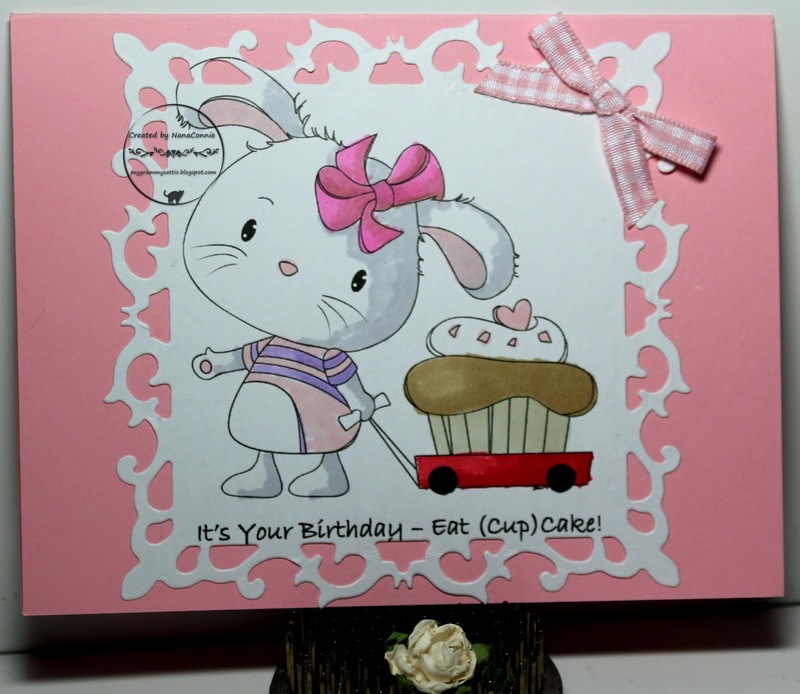 My second card also uses a House Mouse rubber stamp but this time with a cute bunny rather than a mouse. It seems to be more of a fall or harvest image with that huge bushel of apples. It's another one that I've used many times and still love. This one is colored with ProMarkers, then cut with an Unbranded die. I used another die from that same set to cut the mat. 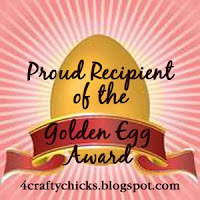 The sentiment was cut with another of my Memory Box dies. This time I kept the white card base and just added more of that same black, satin, ribbon. 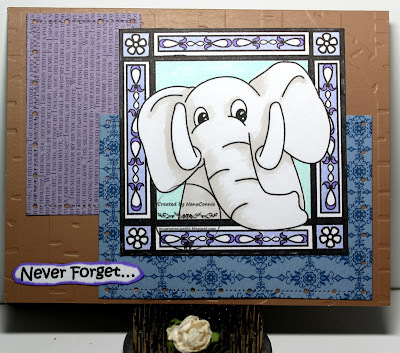 I added the sentiment right on top of the ribbon, then added the image piece and mat. Again, CAS seemed the best design and I really liked the striking contrast of the black ribbon and rich orange colors so didn't want to detract from that with more embellishment. For all of you down under in the Southern Hemisphere, including cousins of mine in Sydney, I hope your summer is warm and wonderful but not overwhelmingly hot. I've done a card with all of you in mind for my GDT spot over at the Outlawz Sunday CAS challenge with a theme of "Summer." This is a refreshing change from the "Snow" theme of last week and I imagine those of you in the north of the US and in Canada will agree. Are any of you tired of winter yet? 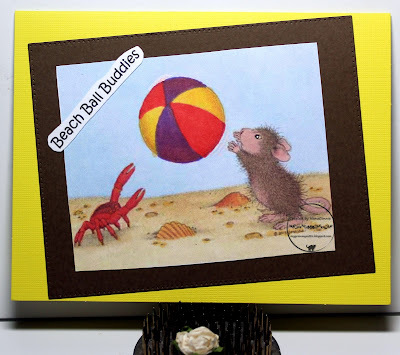 I used another House Mouse image and kept my card very CAS, even with the double layer on the card. I colored the mouse, the crab, and beach ball with ProMarkers and everything else was done with watercolor/polychromos pencils. I cut the image with a die from Spellbinders and then cut a dark brown mat for it with a Pinpoint Rectangle die from Memory Box. but turned it on its side. This is a pretty simple design and I got to play around with more washi tape. 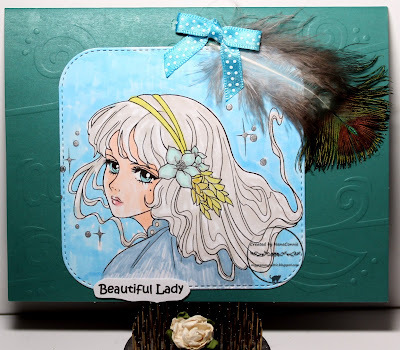 I started by coloring with my ProMarkers and watercolor pencils, then I used a rectangle die from Spellbinders to cut the image. I inked the edges for a bit more definition. 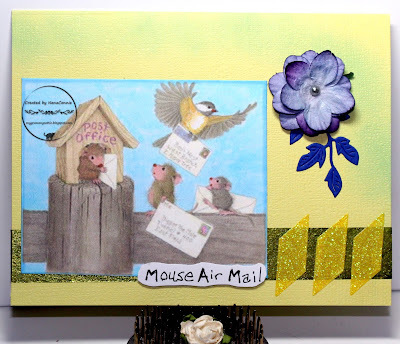 I decided on a pale yellow for the card front and used chalks to distress it. Both the metallic and the glittery pieces are washi tape. I added them along the bottom of the card front and added the image on top. The sentiment is printed and hand cut. For the flower, I cut the deep blue leaves with my oldest die from Cheery Lynn (first one I ever bought! ), then took layers of mulberry petals, stacked them, and added an enamel-head brad to hold them together. Final touch was the little pieces of glittery washi tape. 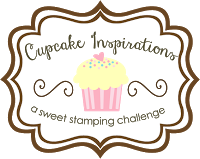 Those were left over from another project and they were cut with a quilting die from Stampin' Up. It's Friday again and you know that means another new challenge at QKR Stampede. Any of you who visit my blog regularly also know that working with QKR images tends to bring our my quirky sense of humor and today is no exception. I love that we have an "Anything Goes" theme every week. It allows me to explore a whole new bunch of images that perhaps didn't fit into particular themes before. This morning I've used "Splatted Bug 14502" for the image and "Sometimes 13506" for the sentiment. For coloring, I used ProMarkers, sparkle gel pen, and chalks. I cut both the image and the frame with a die set from Sue Wilson. Included in that set were the butterflies and I cut those and the flowers from yellow CS, then scattered them across the frame piece. Of the dozen or so Sue Wilson dies that I own, this set is my absolute favorite and I don't even remember the name of it! 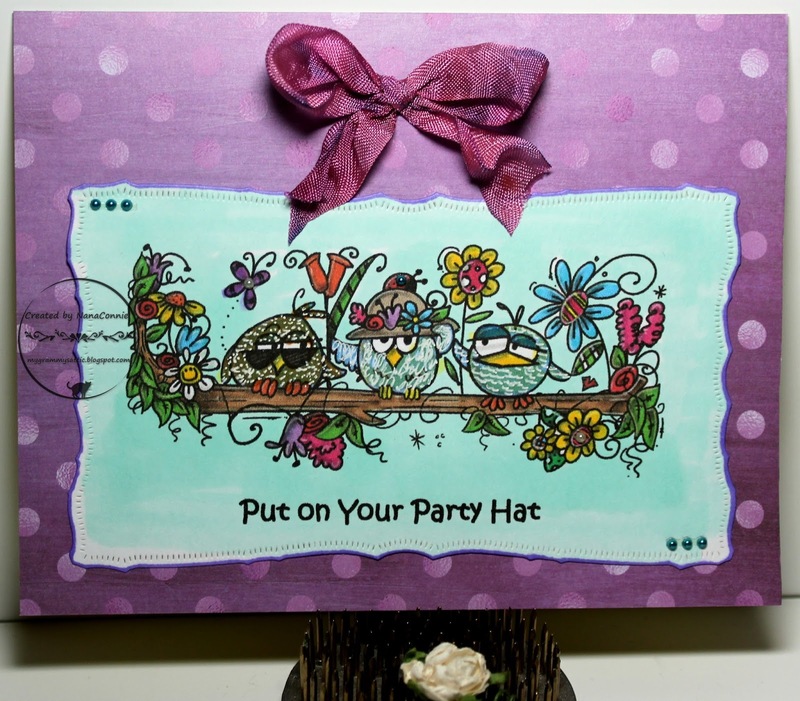 I love the versatility of it and even though on this card it has a "spring" look, it's good for any season of the year. I printed and hand cut the sentiment before adding it below the image. I'm sure we've all heard of fairies but how many of us know about Ice Fairies? Usually, fairies go underground and hide in their homes where it's warm throughout the cold snowy months of winter. But there's a special breed of Ice Fairies who dearly love the cold weather. They score our windows with frost paintings and hang icicles from the eaves and tree branches. This beautiful image must be a clan leader among the Ice Fairies - she's just so glamorous and elegant. This image is from AuroraWings and I had so much fun bringing her alive with color. I used polychromos pencils to color her and blended everything with gamsol. I added touches of white gel ink to certain spots and did her lips and eyes with ProMarkers. 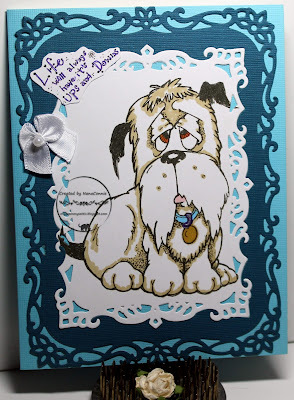 I die cut the image with one of my favorite dies from Spellbinders. I trimmed off a tiny point on each end for a smoother shape and then I inked the edges. The pale blue paper with the tiny snowflakes came from DCWV's "Winter Magic" stack, something I've had in my stash for several years and I'm still working my way through it. For embellishment, I added one small hand-sewn bow with a pearl. 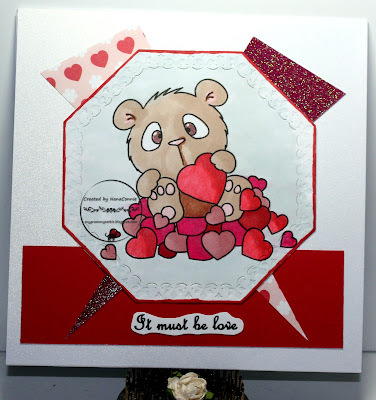 This one is another Valentine and I used an image from Lemon Shortbread, one of my favorite places to play in challenges. turned on end to better fit the shape of my image. 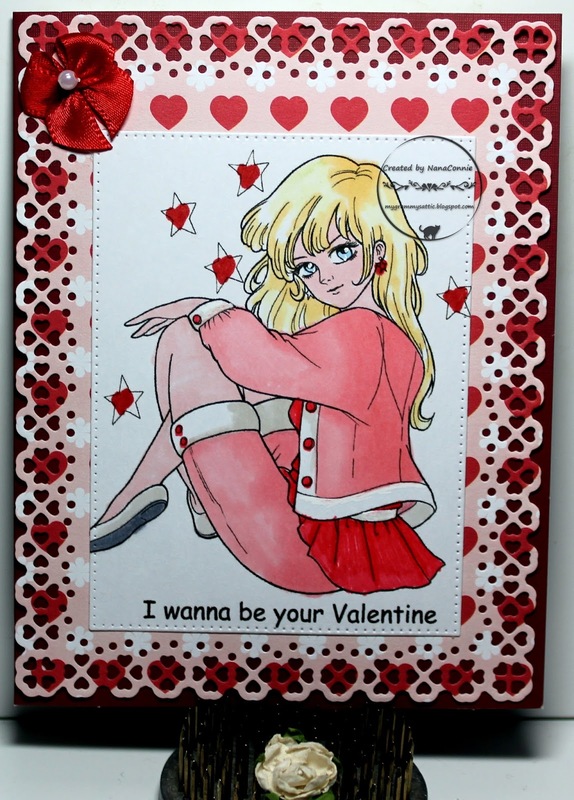 I colored it with my ProMarkers, and added little red hearts to the stars to make it feel more like a Valentine. The sentiment was printed at the same time as the image. I cut the image piece with a pinpoint,rectangle die from Memory Box. The framing piece was cut from some Neenah Products dp with a Gina Marie die. Everything was put onto a deep, burgundy card base. I used one of my tiny, hand-sewn, bows which I make up by the dozens and toss into my stash for future use. I have come tot he point where I only make them from white satin ribbon and then I use markers to "dye" them the colors I want for a particular card. I was so sad to find that one of my favorite artists has closed his challenge blog. :-( But I adore all his artwork and will continue to use his delightful images. Yes, I'm talking about Rick St. Dennis. 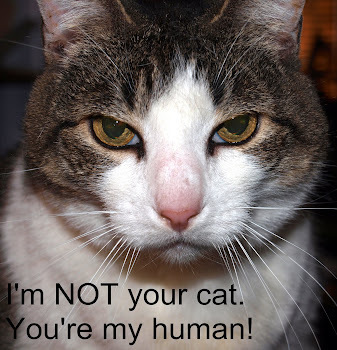 This image is especially precious to me since I live with a couple of felines who think just like this! I used ProMarkers to color the image and added a tiny pearl to her scepter. I fussy cut the image, and layered it onto a piece of foil paper. The little snowflakes were embossed with a stylus and the corners were rounded with a Fiskars punch. I did learn the hard way that the punch didn't work well on the heavy foil paper but at least the corners were rounded. Those two pieces were mounted onto a triangle scrap of mulberry paper before I added it to the card front, which had already been chalked around edges. I added sets of three pearls to three corners and then added the sentiment. I think she's a perfect Snow Queen! 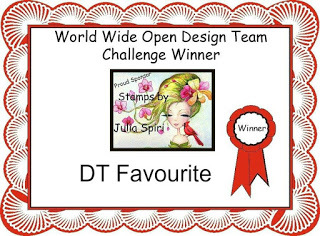 This is another of the new images which were part of my challenge win from Ching-Chou Kuik. This is my first time coloring it and I'm thrilled by the result! It's called "Butterflies and Berries." I colored the butterflies, berries, and her face with my ProMarkers, then used water color pencils and gamsol for her dress, hair, and the sky/background. Then I thought about how I wanted to cut out the image. I dug around in my huge stash of dies, found one by Bo Bunny which was about the right size and shape for the image but it had lots of internal filigree bits which would cut into the image. So, I laid the die on top of the image, drew around the outside of it with a pencil, then hand cut the shape with scissors. I wanted to frame the image so I used my newest die set from Spellbinders (thank you to Santa!) for the first time and I can tell you that die set is going to get lots of use! 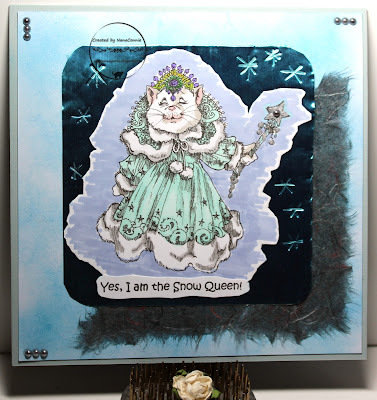 The frame is cut from textured paper which was a leftover scrap of 12 x 12 scrapbooking paper. After I added all of that to an ivory card, I found a 6 inch scrap of sheer, gold, ribbon begging to be used so I tied a tiny bow and added it to the top. 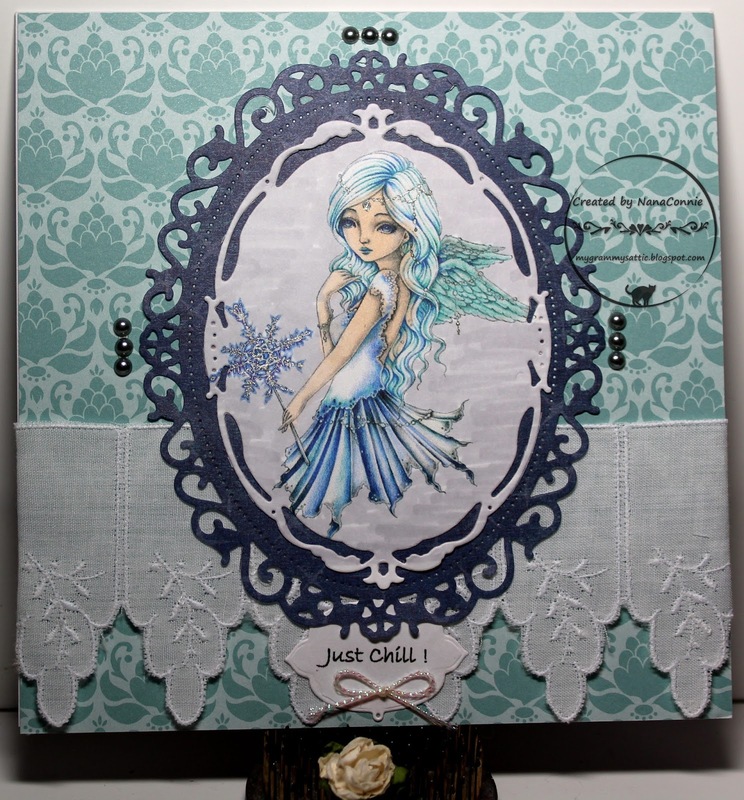 Today I have the honor of being a Guest Designer for the next two Sundays at the CAS challenge at The Outlawz. Today we have a theme of "Anything Snow Related." 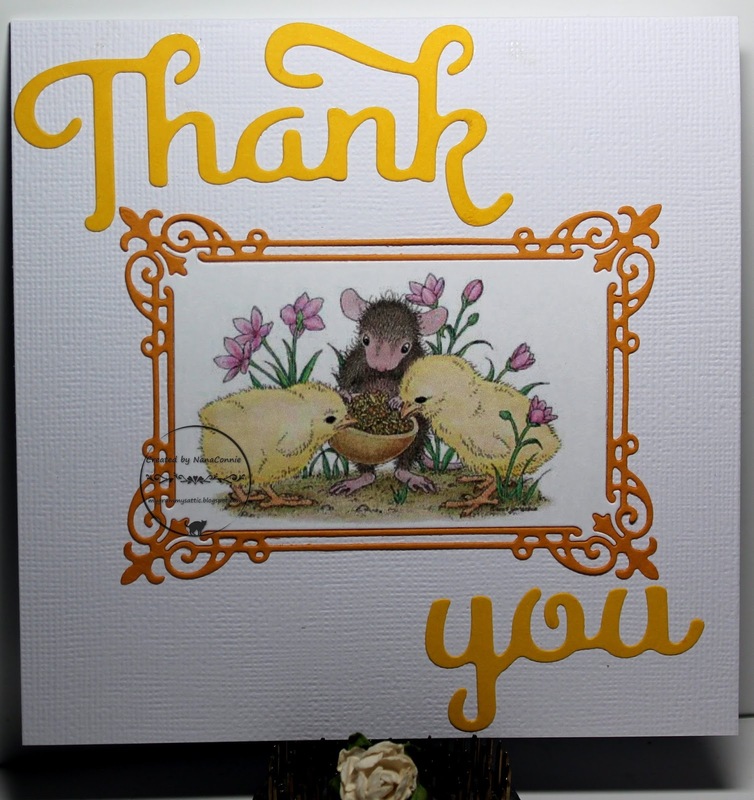 I chose this darling House Mouse image as the focus of my card. It's a pretty simple design because this is the Clean and Simple challenge, calling for lots of open white space. I used my ProMarkers to color the image, adding a touch of white gel ink for highlights. I cut the image with a Gina Marie "Chain Link" die. I mounted that piece onto an embossed card front (used my "Linen" folder) and then started looking through my ribbon stash. I found two different sheer blue ribbons and used one to wrap the card front and the other to tie a quadruple loop bow. That was it - done! Well, it isn't snowing here but it's been raining for the past 36 hours, almost without stopping. That's fine with us since we had a much dryer December and early January than is normal. Since we're just coming out of a severe 4 year drought, we are grateful for every drop that falls. 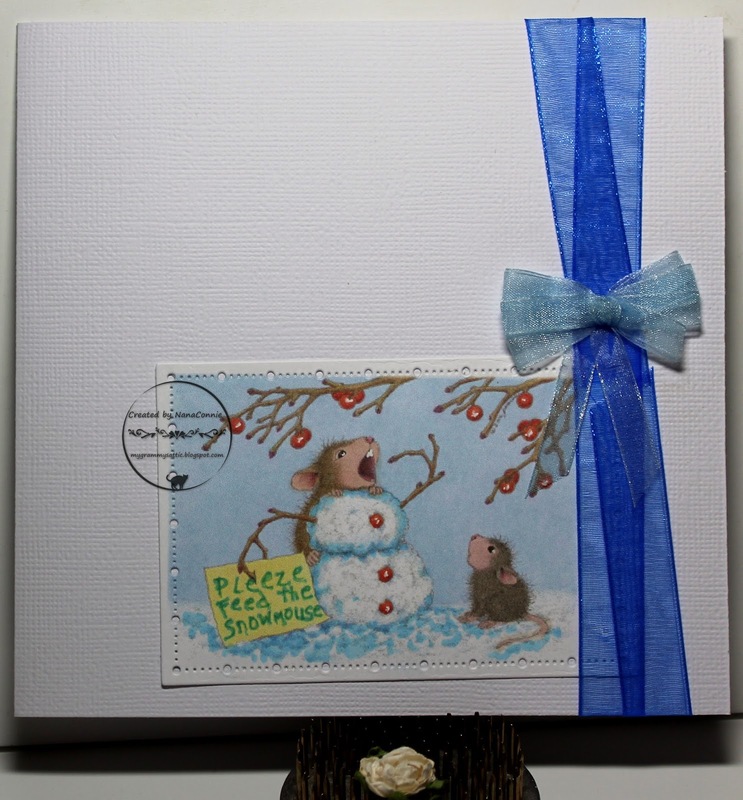 But I did combine two, wintry, images from Beccy's Place for this fun card celebrating snow. 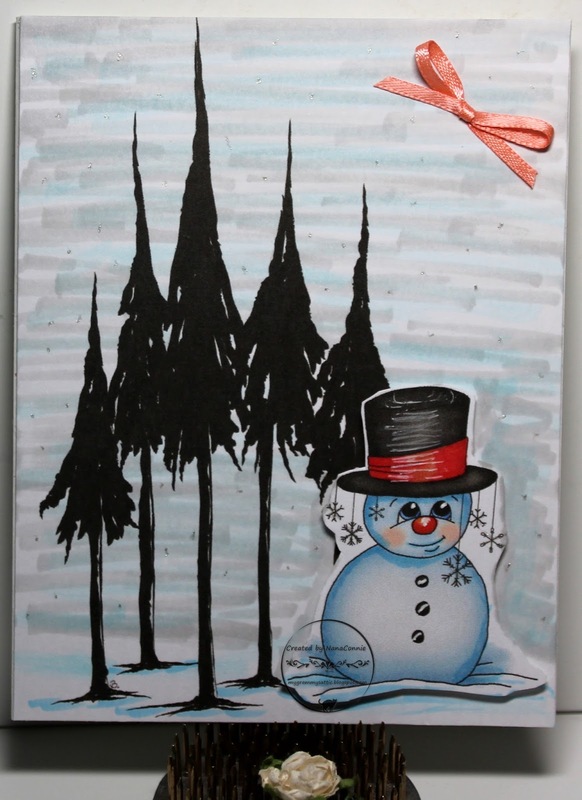 I printed the two images separately and colored the background (both sky and snow on the ground) around the trees with ProMarkers. I colored the snowman with ProMarkers, also. I added sparkle gel ink to the snowflakes hanging from his hat but that's hard to see in the photo. I fussy cut the snowman and used Pop Dots to adhere him to the card front. I added only the tiny ribbon bow as embellishment. 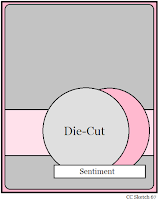 I haven't decided on a sentiment yet because I'm not sure how I'm going to use the card. I think it'll probably end up as a birthday card. Today at Catch the Bug they want us to use an inspiration photo with great colors plus add sprinkles. 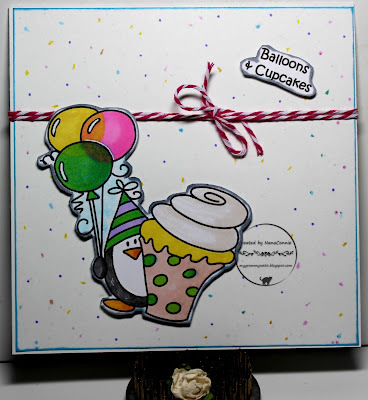 Sprinkles are always good for a birthday party and I chose confetti CS to use as my card base, giving me 'sprinkles' of color dots in the background. I enhanced them a bit with my ProMarkers. The penguin with his balloons and cupcake is one of the newer images from Bugaboo Stamps and I colored him with ProMarkers, then fussy cut the image. I mounted it onto Pop Dots, giving it a bit of dimension. I printed the sentiment, added dimensional tape to it, and put it in the upper corner. 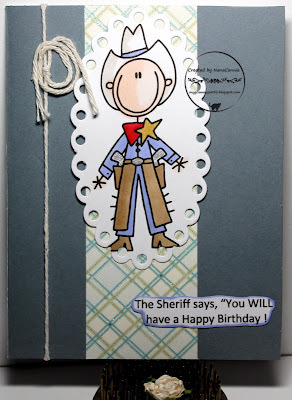 Twine was my final embellishment and now I've added one more CAS masculine birthday card to my stash. Remember that silly nursery rhyme? If you read the post title, I know you're already saying it to yourself in your mind if not out loud! "Hey, diddle, diddle..." :-D Well, it seemed to apply wonderfully to this new-to-me image from QKR Stampede. 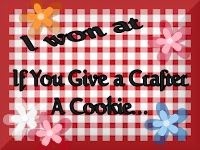 When I saw it, I decided it had to be used in the latest "Anything Goes" challenge over there which starts today. 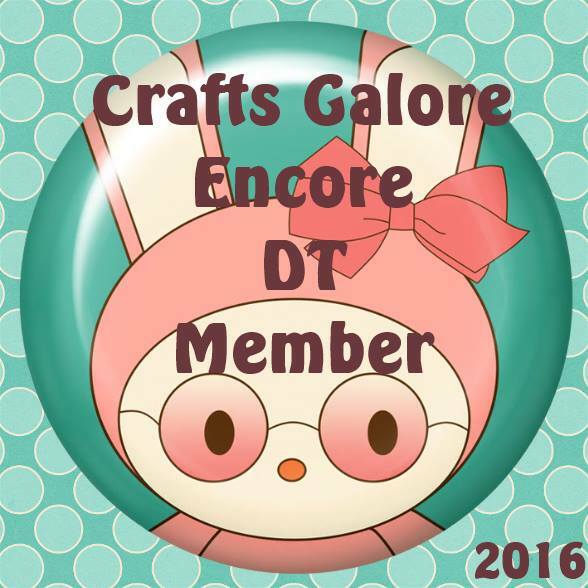 Any of you who have followed my blog, or even visited regularly, know my quirky sense of humor, especially when doing my DT cards for QKR Stampede. This image is called "Cow over the Moon 18301." The silly sentiment is my own. I colored the cow and moon with my ProMarkers, then cut it into a rectangle and punched the corners with a Fiskars punch. 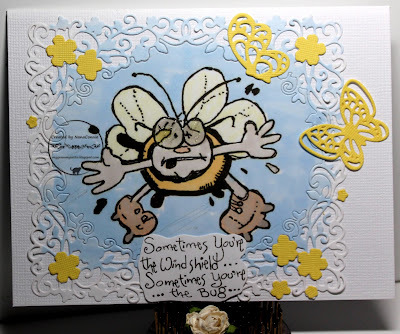 The background die cuts were made with dies from one of my framing sets by Spellbinders. Those framing sets are definite favorites! 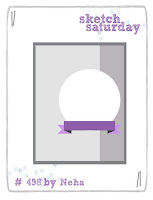 They can be layered together or even inset (as in this case) and they make a simple card look very complex. The embossing is wonderful, too. I added brown grosgrain ribbon and tied a triple loop bow using my bow maker. 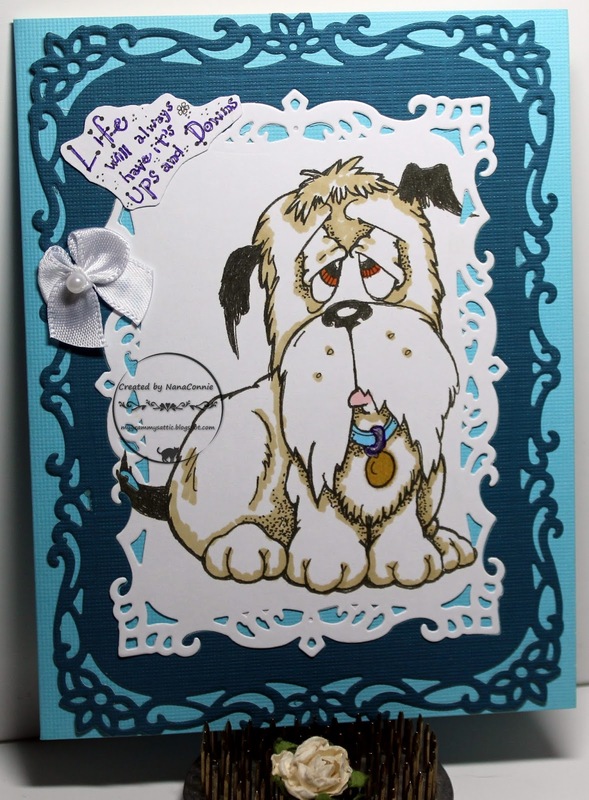 The sentiment was printed, fussy cut and added on top of the other layers. I colored with ProMarkers and Copics, then cut the image with an Unbranded die. The paper is from my newest DCWV stack, two sided and torn in two, with one piece reversed. I love the distressed look that created! The sentiment is printed, matted and hand cut. What appears to be ribbon is actually glittered washi tape. I made one of my little hand-sewn bows using sheer ribbon. I know a good many of you have homes which are graced (?) 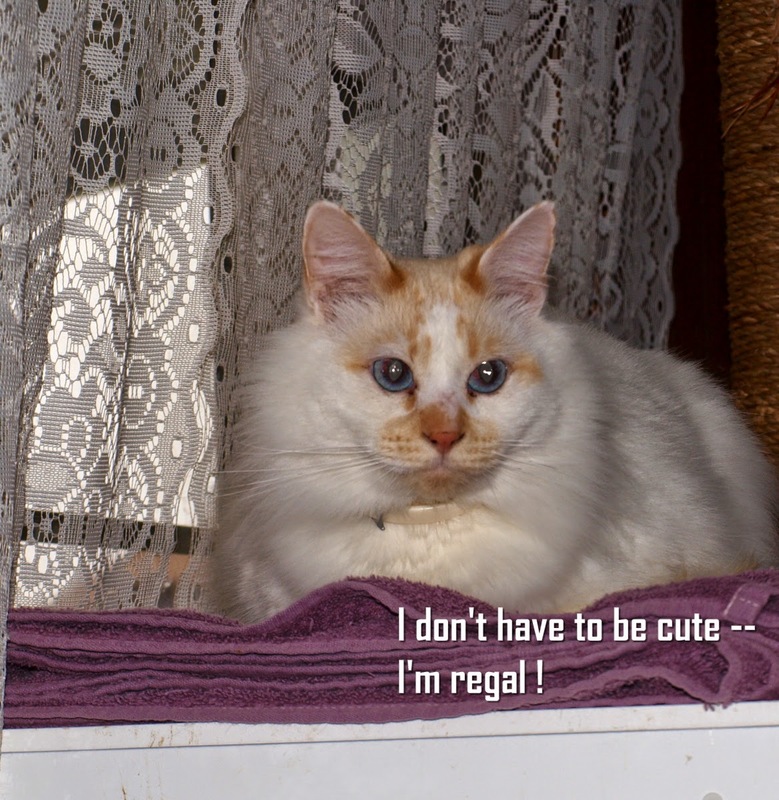 by cats and at least some of you banish the cats to the outdoors when you have the house all dressed up for a party. But I want to share with you what happens at my house when you don't invite the cat(s) to the birthday party! 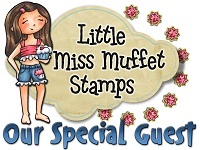 The image is from Bugaboo Stamps in honor of Day 4 of their week-long, 8th Birthday Celebration. 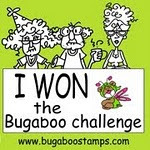 The theme over there today is Bingo and I used Funny Sentiment/Bugaboo image/ Die or Punch. 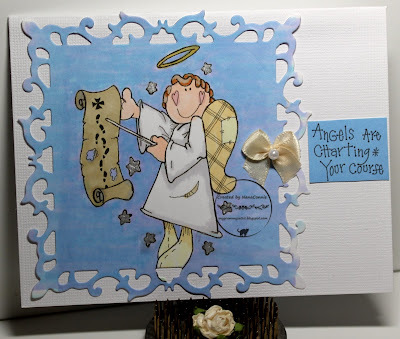 I colored with ProMarkers and die cut the frame for the image with a Gina Marie die. 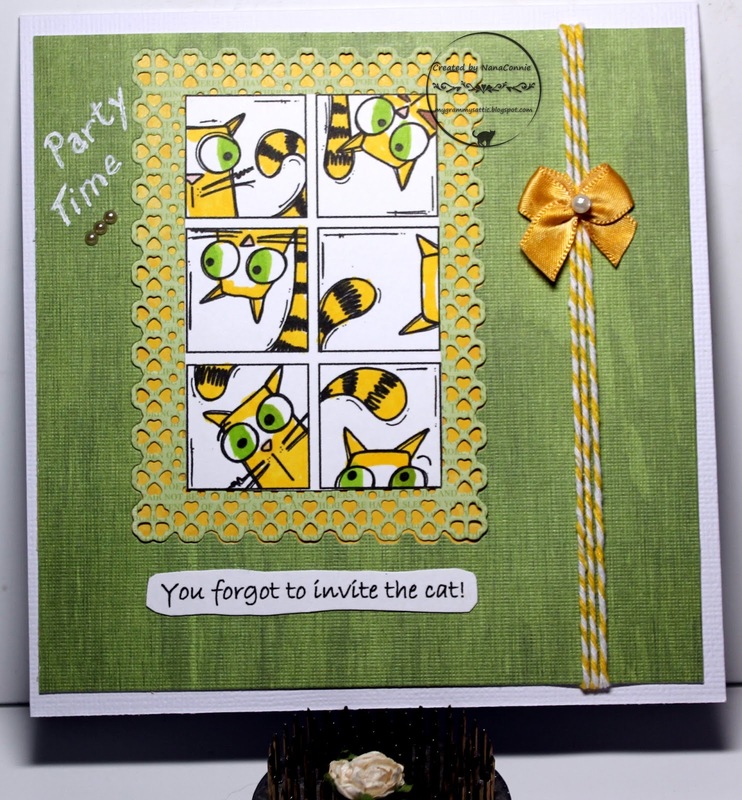 I used that same die to cut the green background paper, then inserted the image and frame into window cut. I backed that with yellow dp and added the yellow baker's twine. That went onto the card front, leaving a white border all the way around. I used a ProMarker to 'dye' the satin bow the exact color I wanted. 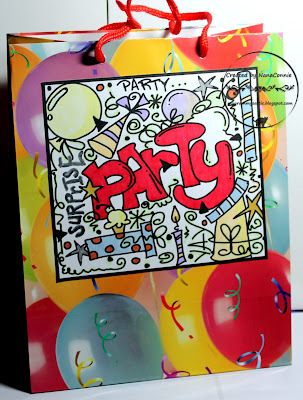 The "Party Time" is embossed with white EP and the sentiment below the image is printed and hand cut. I added three, tiny, yellow, pearls below the upper sentiment. 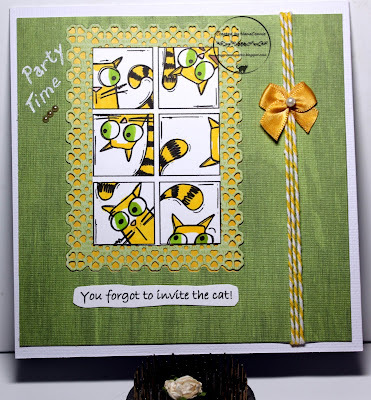 Here it is Monday and the theme at the week long birthday celebrations at Catch the Bug is "Anything but a Card" so I stuck with the birthday idea and made a gift bag using an image from Bugaboo Stamps and 12 x 12 scrapbooking paper over lightweight CS. I thought the balloons on the paper fit in perfectly with the idea of a birthday party so I tried to match colors from the paper when I colored the image with ProMarkers. To make the bag, I followed instructions I found years ago on some packaging. I used two 5 x 7 sheets of light CS for the sides and one 4 x 5 piece for the bottom. I used two full sheets of the balloon paper, taped together along one side to make a 12 x 24 inch piece, and I adhered the CS pieces to the back of the paper (what will make the inside of the bag.) I trimmed it to size, leaving enough paper to fold in and make the sides of the bag. I added 2 heavy CS strips to the inside top on each side, punched holes, and added the woven trim to make the bag handles. I inserted an end through each hole and tied a knot to keep them from pulling out. I used ProMarkers to color the image, then cut it with a die from QuicKutz. I brought out my stash of saved scraps and found the piece of plaid, glittered paper from the "Linen Closet" stack by DCWV. It's hard to see the glittery sparkle but if you enlarge the photo, it'll show up. With a bit of a trim on the end, that scrap worked perfectly. I added the image piece and began searching the scraps again for a background. There was a scrap of Winter Blue CS exactly the size of an A2 card so I used it and added the strip and the image to it. That went on the card front. I printed the sentiment, hand cut it and added it. 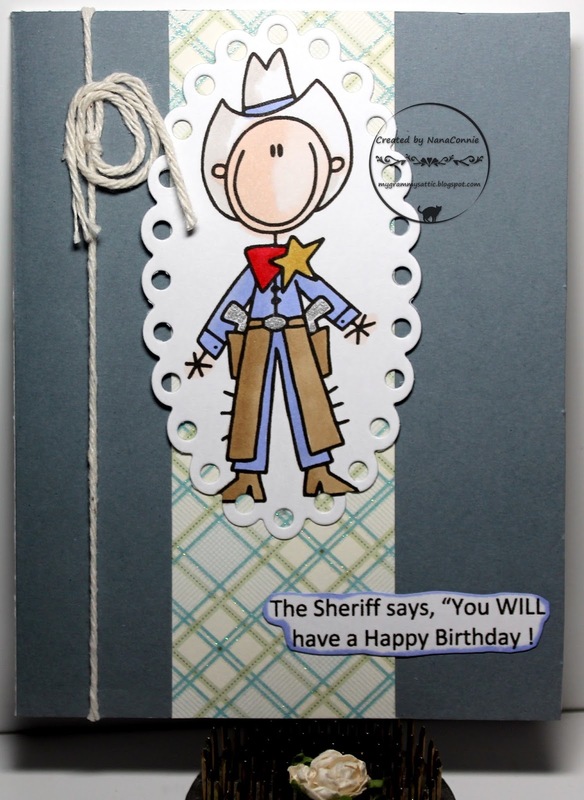 Finally, because this is a Western themed, masculine card, I added the twine and made a lariat instead of a bow. 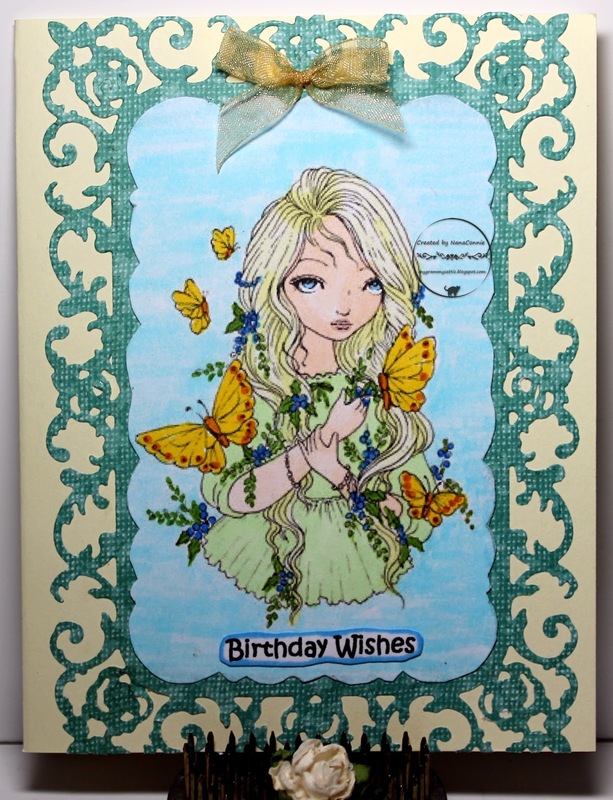 One more CAS, masculine, birthday card for my stash! 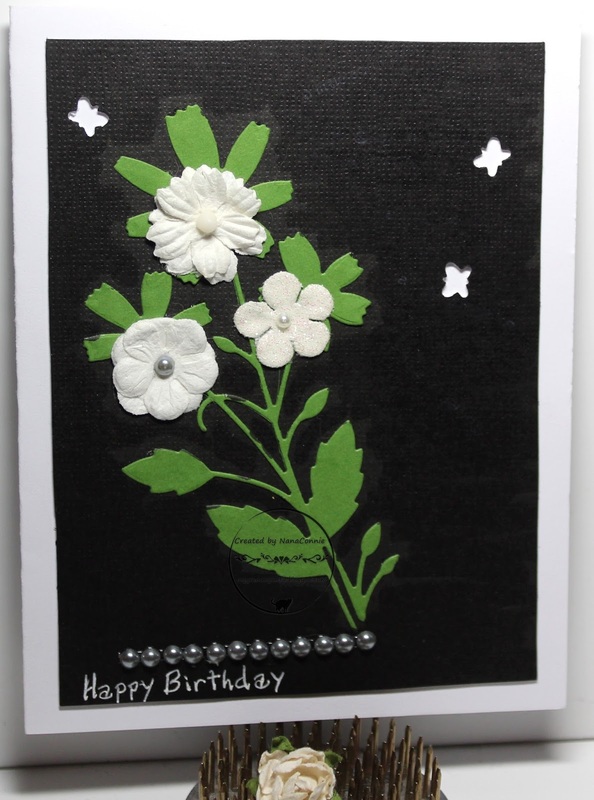 Today I want to share with you a card which was a joint effort with a delightful 11 year-old. I was working with a group of girls ages 9 to 11, who were sharing a play date about coloring. I was introducing them to markers as a step up from crayons and I had taken with me a couple dozen images on a flash drive. I colored a couple of printed samples to show them how alcohol markers worked and this particular young lady was interested in how I did the shading to emphasize a light source and shadows. She took one of the images and did her own shading on it as I gave her suggestions. She was so proud of it and wanted to know if it could go on birthday card for her mother. She even gave me the idea for the sentiment so I printed another image with the sentiment added and she colored it again. This one was even better! She chose mostly pink markers this time, using gray markers for the shading. I brought her colored image home with me and turned it into this card, then send it to her so that she'll have it for her mom's birthday on January 29. Since this is the image (complements of Di's Digi Designs) for the Outlawz Progressive Challenge, I'll use this card as my entry over there. 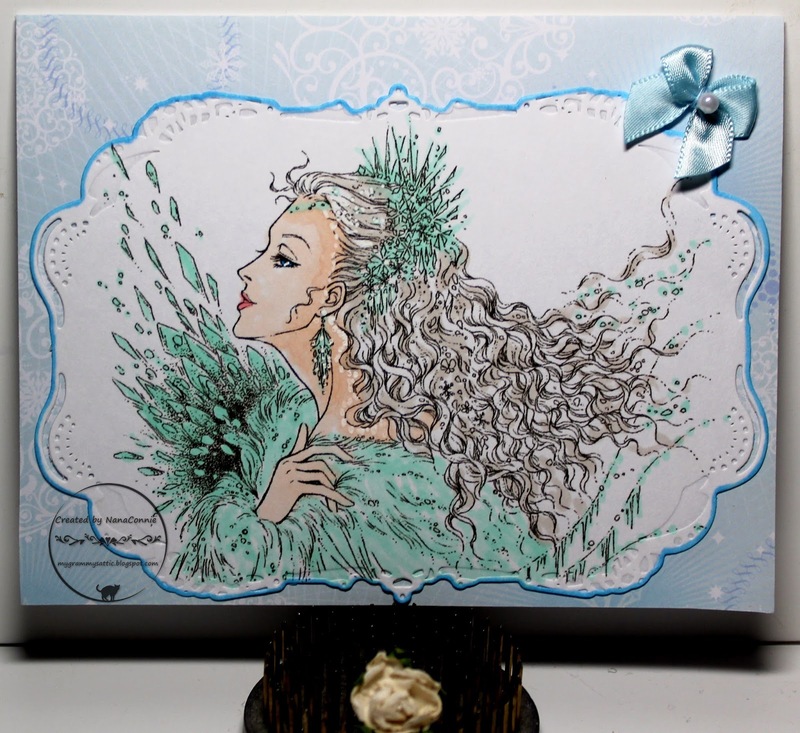 After she colored the image (ProMarkers and Tombows), I cut it with a die from Spellbinders. 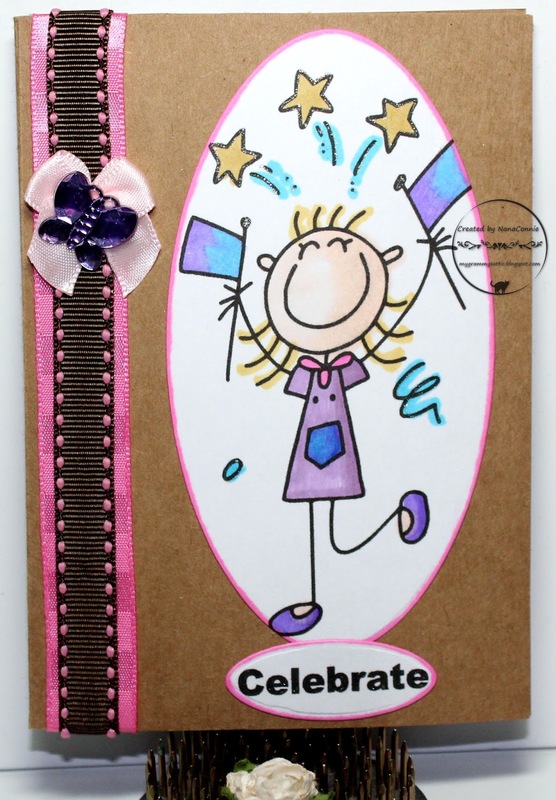 I layered that onto a pink card base and tied a simple bow using pink, gingham ribbon. 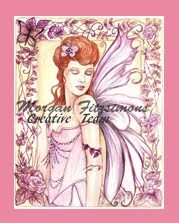 I kept the card design very CAS so that the fancy frame would be a focus point, along with her coloring. 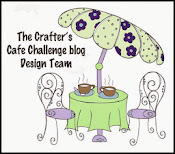 This morning I discovered that Catch the Bug is celebrating its birthday all week long, with a different challenge and theme each day, and despite being somewhat feverish and achy, I want to play along. So here's my card for their first theme which is "Bold and Bright." 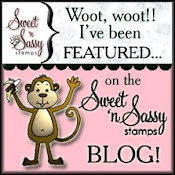 The image is from Bugaboo Stamps and is a new one for me. 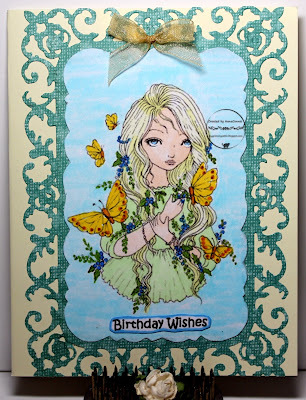 I colored with ProMarkers and gel pens, die cut the image with a die from Spellbinders, inked the edges and mounted it onto distressed dp from Paper House. I added tiny pearls to the corners of the image, and single pearls to the butterfly, the ladybug on her hat, and one of the flowers. The bow was hand tied using my new, scrunched ribbon from DL.Art. They have the most gorgeous ribbons! Even though the "white" space is actually dp space, it's still a pretty CAS card, easily mailed. 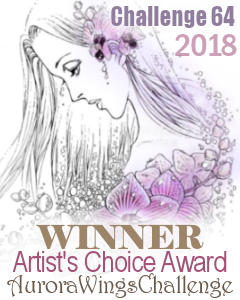 I'm sharing another card with an image from Ching-Chou Kuik where I was lucky enough to win in two different challenges, one sponsored by them and the other as part of their FB blog hop. I'm going to be coloring their glorious images for several days now. 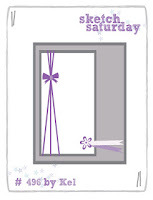 :-D Here's the first card I've done with one of my new images and I'll have another one later next week. I knew as soon as I saw this image that I wanted to do something fancy and vintage looking. But it still needed to be flat enough for easy mailing. I colored with ProMarkers, white gel ink, and a sparkle gel pen. I cut the image with a die from Spellbinders. 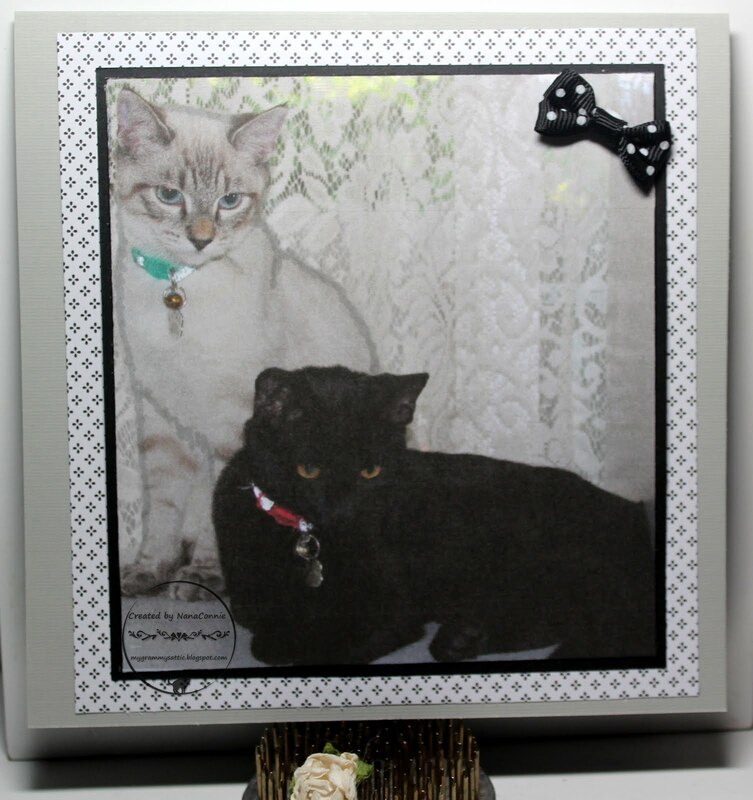 I used another Spellbinders die to cut the blue star dp, then used it to frame the image piece. I found the lace in my stash. It's one of those "have to have" purchases which get put away and forgotten so this is the first time I've ever used it. Another "new" thing for my card. The background paper is also new, purchased last week from the open stock papers at my favorite scrapbooking store. I cut a 5.5" x 5.5" piece and put that onto the card front. Then I added the lace and the double framed image. I printed the sentiment and die cut it before adding it to the bottom of the image. I found a tiny scrap of thin, white, braided twine, tied it into a bow, and layered it onto the sentiment piece. Finally, I used 3 sets of three pearls each (also a new purchase); one set on each side and one set at the top of the image. I colored with my ProMarkers, then cut the image with a square die from QuicKutz. The two rectangular pieces of dp are cut with Chain Link dies from Gina Marie. Both of those papers are from SU. 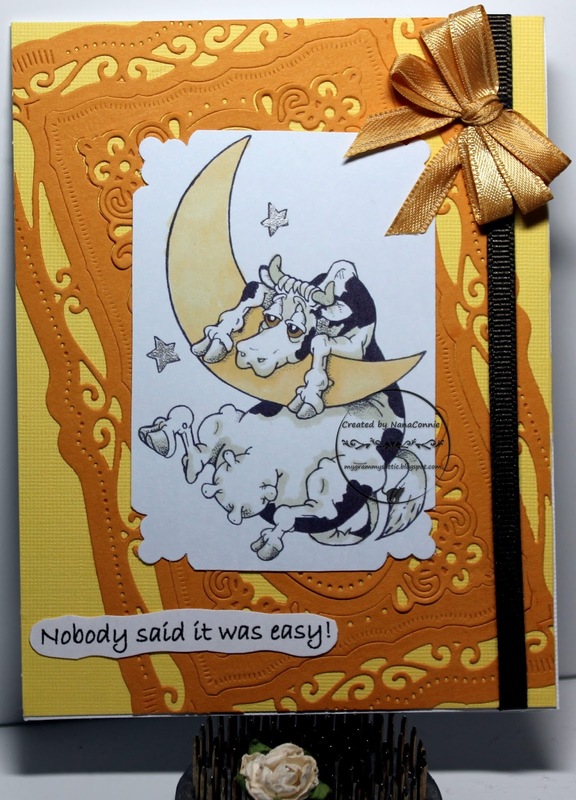 The card front is dry embossed with a bamboo embossing folder. I printed the sentiment, hand cut it, inked the edge, and mounted it onto the card front. Because this is a masculine birthday card, I did no fru-fru embellishing. When I saw this darling little bear buried in a pile of hearts, I just had to get my first Valentine of the year done. 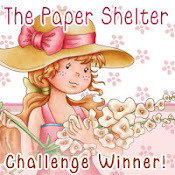 The image is from the monthly progressive challenge at Gerda Steiner Designs. I used the sketch from Cheerful Sketches. Those two triangular strips are harder to plan than I first imagined when I looked at the sketch. I ended up using two different types of dp, one glittered and the other with polka dots. After I had already colored him with my ProMarkers, I realized he would have made a perfect little Panda but I was staying with the colors for the February Card Chain Challenge so I'll leave him as is. Next time, I'll try him as a Panda Bear. After coloring, I cut the image with a die from Spellbinders, inked the edges, and added the triangles. 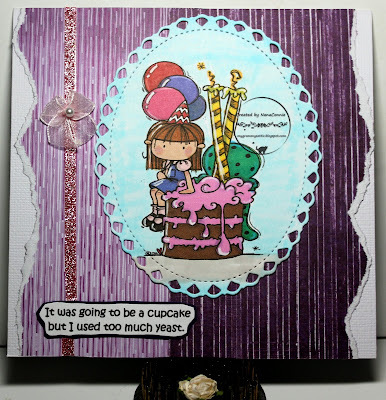 The sentiment was stamped and hand-cut, then layered onto the red CS strip along the bottom. Since this one is going to get mailed halfway across the world, I left it pretty flat and CAS - no additional, bulky, embellies. Continuing with my post-Christmas, Thank You cards, today I want to share one with a sweet and fun image from House Mouse. I colored the image with a combination of ProMarkers and polychromos pencils, then cut it with a simple rectangle die from QuicKutz. 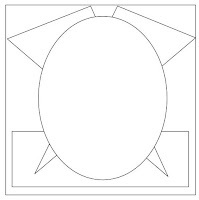 The frame piece was cut with a Bo Bunny die. 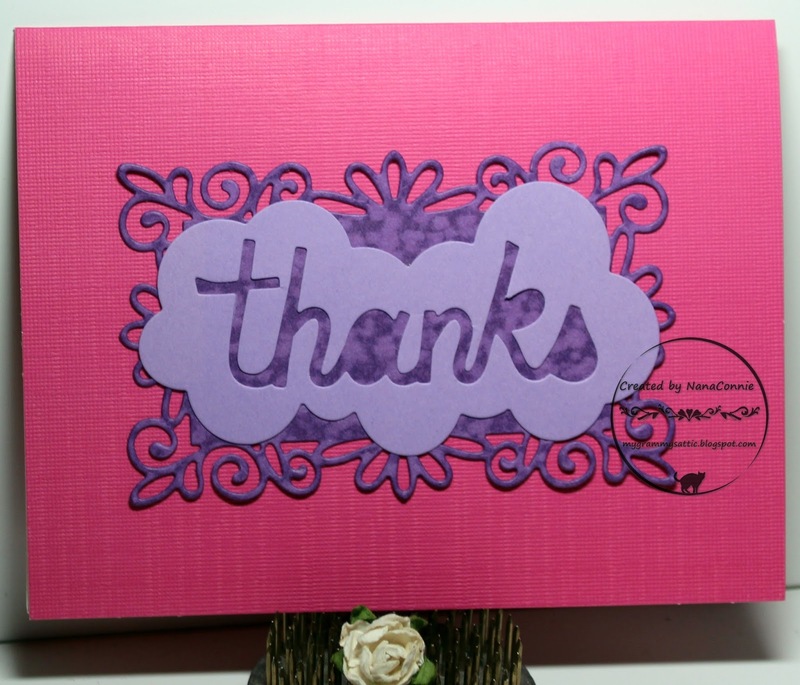 The "Thank You" sentiment was cut with a die from Die-mensions. I was lucky enough to be a challenge winner last week at a challenge which was sponsored by Lemon Shortbread and I could hardly wait to get this image colored up! It's new to me (and maybe new in the store) but it was one of the images I chose as my prize. Doesn't she make a fantastic Winter lady? 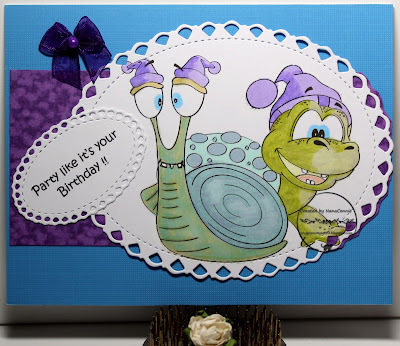 Today I'm using a brand new image from Sasayaki Glitter and that little snail just makes me laugh! The turtle is also cute but the silly smile on the face of the snail is just too much. I decided they looked like they're wearing party hats so I used them to beef up my stash of birthday cards. but turned one-quarter turn to accommodate the shape of my image piece. As usual, I used my ProMarkers to color the image, then cut both it and the sentiment with Unbranded dies. I found a scrap of bleached purple CS and another scrap of turquoise CS, embossed with my "linen" folder, and used them on the background. 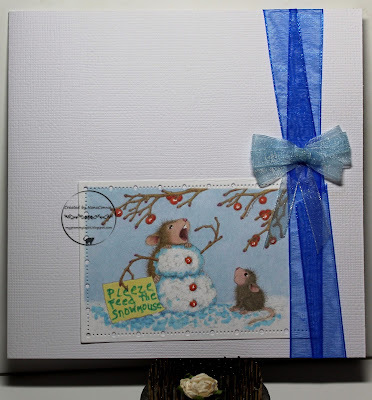 I wanted to leave this one very simple so I added only one small ribbon as embellishment. 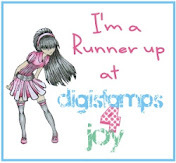 We've never required anyone to use stamps/images from QKR Stampede (or our sister images from Eureka Stamps) but if you do use either of those on your project, your entry will be put into a separate drawing, just for people who use QKR Stampede or Eureka images and that increases your chances of winning by a huge amount! I used this sweet "Angel Charting" image from QKR and an "Angels Charting" sentiment, also from QKR. I used ProMarkers to color the image, including the sky, and added sparkle gel ink to the stars. I cut it with a die from Spellbinders and mounted it onto a plain white card base. I printed the sentiment, adding a blue background with my editing program, and put that next to the image. For embellishment, I used one of my small, hand-sewn bows. Today is the start of a brand new monthly challenge at Emerald City and I hope you're going to come play along with us. This box lid is done using a wonderful and fun image from the "So Cute" ephemera collection at Linda Simpson Designs. In addition to the wonderful images available, Linda Simpson Designs has sets of gorgeous digital papers and I used one of the pink ones from the Nostalgia Set #3. 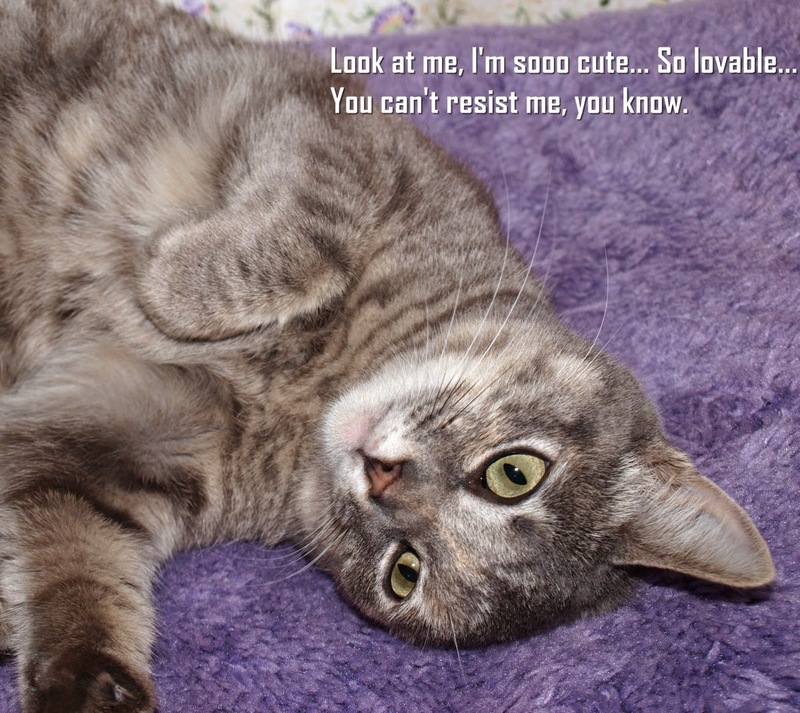 While there are lots of sweet images in this particular collection, I had to choose one with kitties, of course. :-D I made the lid using a box maker and have yet to complete the bottom. I ran out of the heavy duty card I used for hte lid and have to get more before I can finish the box. I added lots of gems and pearls, plus bits of lace scraps and a wonderful white butterfly. 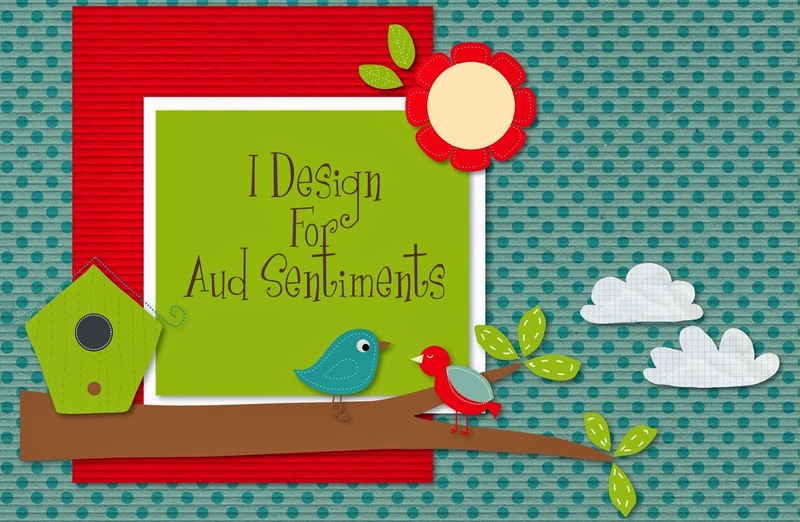 The "Smile" sentiment was cut with a die from Sizzix. 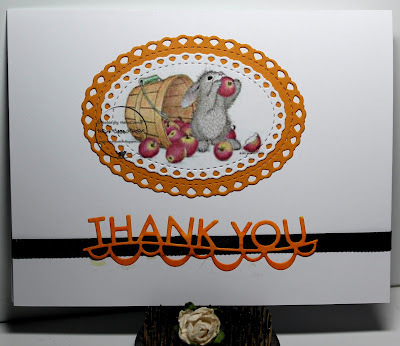 One of the things about the Christmas holidays and all the gifts is that there is an immediate need for Thank You cards. I usually start making them during the holidays and this year was no exception. I made more than a dozen, some of which I shared with family members who needed them. I'm still making a few more and will post those as they are completed. In the meantime, here are the first two I finished and mailed. This one was pretty simple to make; it's nothing more than die cuts, dp, and CS. The background cut was done with one of my newest die sets from Sue Wilson (Merry Christmas to me! ), cut from bleached dp. The sentiment piece is actually the 'negative' piece left over from cutting out the word "Thanks." That's a die from Memory Box and I think it looks like a cloud. I layered the cuts together, and layered them onto a pink card base which had been embossed with my "Linen" folder. This is another card done all with die cuts but it's a bit more complex. The card base is another pre-made card and, again, I ran the front of it through my "Linen" embossing folder to give it a bit of texture. The sentiment is cut with the same Memory Box die as I used above but from different color CS. The "quilted" star was cut with my other brand new die (from Stampin' Up) and I know I'm going to have tons of fun with this one! Talk about versatile - more design combinations than you can imagine. Great value for the money. All of that glittered "paper" is actually cut from 6" x 6" sheets of washi tape. The sheets have a clear backing paper which peals off to expose the adhesive. I cut 4 different colors of the glittered washi sheets, then pieced together the shapes to make the star. I needed a quick January Birthday card and my stock of feminine cards was getting pretty low. This was a fast and simple card done with die cuts, white ink pad, stamped individual letters for the sentiment, pearls, and layered or glittered hand-made flowers. 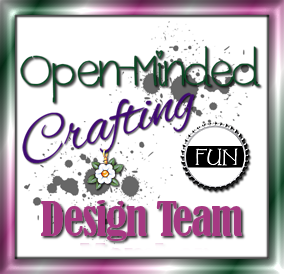 I started with a black scrap of CS and layered on the green die cut (Memory Box.) I used one of my very old, hand punches (maker unknown) to punch out the butterfly shapes from the black CS. I dug through my flower petal dies (Spellbinders, Sizzix, Memory Box) and scrap papers, looking for different texture and shades of white. I chose mulberry paper, glittered CS, and watercolor paper, then die cut each of those a couple of times. 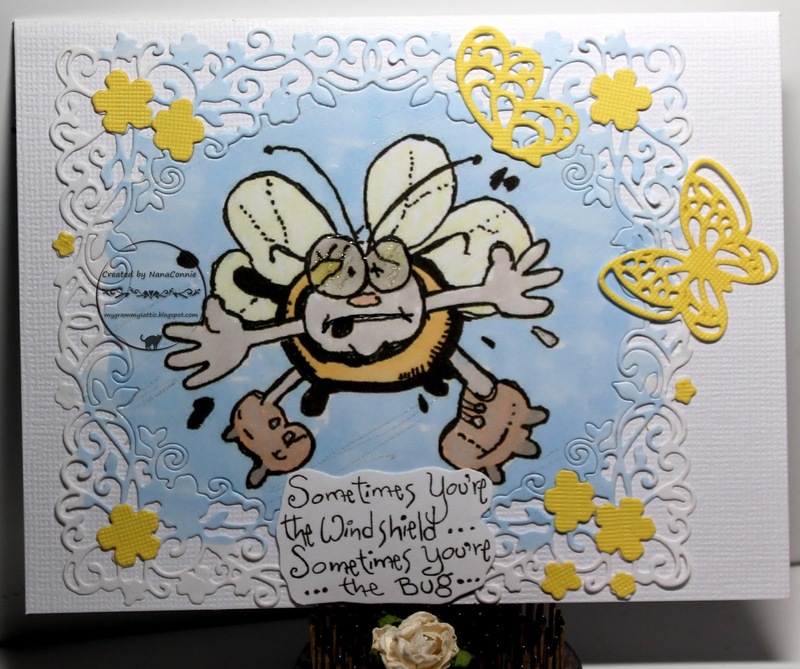 My flower dies also emboss the petals so that added to the texture of the layers. The final embellishment touch was the row of black pearls along the sentiment.